I think it’s safe to say that this winter has been a doozie. The winter of 2013-2014 was marked by an alarming number of extreme weather events including the Polar Vortex in the Midwest, ice storms in the North East, and substantial snowfall in the South. Furnace installation and repair numbers were high this year as people in the north struggled to repair their overworked furnaces and folks in the south considered purchasing a furnace for the first time. Have no doubts, it was a particularly cold winter this year. Where were you during these extreme winter weather events of 2013-2014? Great Plains Blizzard Winter came early to the Great Plains when a storm system that included thunderstorms, tornados and snow dumped up to two feet of snow on Iowa, Nebraska and Wyoming on October 3rd, 2013. Christmas Ice Storm An ice storm on December 22nd, 2013 knocked out power in much of Maine, Michigan and upstate New York. Many people in northern and coastal Maine were without power for the holidays, and some had to wait until the New Year before power was restored to their homes. The Polar Vortex The term “polar vortex” took on real significance during the first week of 2014, when snowfall and unusually cold temperatures chilled North Americans living as far south as Central Florida and Northeastern Mexico. Temperatures in the south hovered around freezing while temperatures in the North dipped down to -20 Fahrenheit. 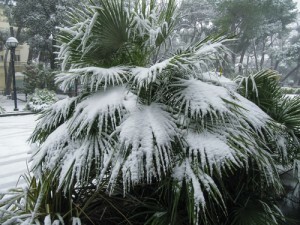 Snow in the South Snow is rare in the southern United States. However, this winter the American South got slammed with enough snow and ice to create power outages, flight cancellations and massive gridlock. Trafficpocolypse in Atlanta A few inches of snow brought the city of Atlanta, Georgia to a stand-still on January 29th, 2014. Snowy, icy roads created gridlocked traffic conditions that trapped people in their cars for days, or forced them to walk home on foot. Oregon’s Snow Storm Oregon and SW Washington were hit with a foot of snow in early February, 2014. The snowy and icy conditions caused school closures and terrible, multi-car accidents across the state of Oregon. Embarrass Minnesota: the Coldest Place on Earth The little town of Embarrass Minnesota experienced a low of -37 degrees Fahrenheit on January 2nd, 2014 which was the coldest temperature on earth that day. Icy Roads and Flying Trucks Roads across the US have been exceptionally icy this year. This YouTube video, which shows a truck sailing off an overpass in Minnesota, illustrates just how dangerous icy roads can be! Coldest Winter in 30 Years Minnesota is experiencing the coldest weather on record since 1984. What about your state? January 2014 4th Warmest on Record Wait, how can that be? It felt so cold here in the US this January! In fact, when considering temperatures all over the globe, January, 2014 was the 4th warmest on record, with global temperature records dating back to 1880. What was the worst extreme weather event for you this winter? Are there any extreme weather events from 2013-2014 that weren’t included here? Comment below with your memories from the winter of 2013-2014!